Fun Fact: Over 20ft of EL wire was used to light this prop! Upon finishing my Daft Punk helmet, I began exploring different music producers who had unique costumes and stage props. 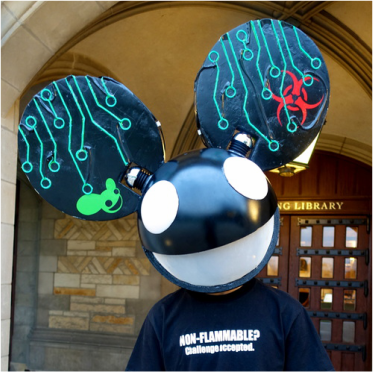 Deadmau5, like Daft Punk, wears an iconic helmet during his performances, one that has many different designs and limitless possibilities! 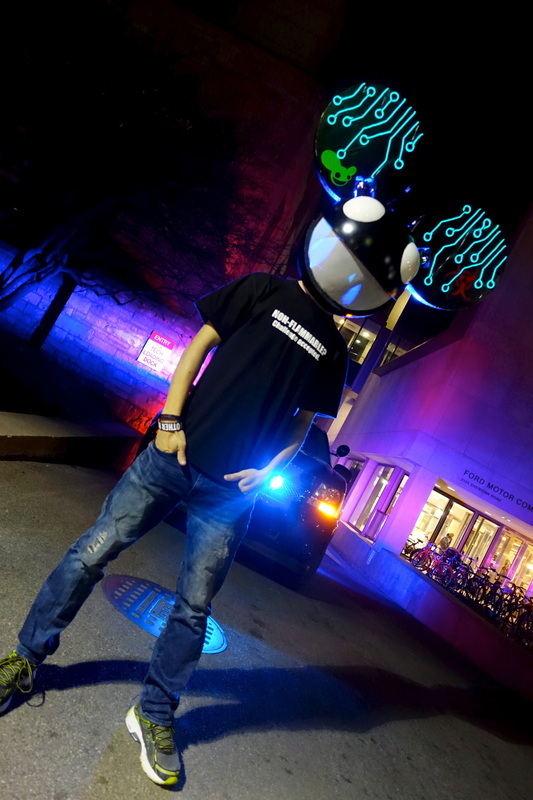 Using official Deadmau5 released measurements of his helmets, I decided to make a custom Deadmau5 helmet with an original design. The helmet sports a custom circuit board pattern on the ears, with EL wire on its surface. This EL (electroluminescent) wire glows and can also pulse in response to the music being played from the helmet! The eyes and mouth can also be illuminated by means of more EL wire and LEDs. Lighting the interior of the helmet does not affect visibility, thus having no significant impact on user safety. This prop features two speakers located at the base of each ear. With Deadmau5 being a music producer, I thought it would be appropriate to outfit the helmet with audio capabilities. The speakers naturally project out of the helmet and are controlled by a phone that can be stored within the helmet. Wherever the helmet goes, amazing beats are sure to follow! A full write up on this prop's build process can be found in the Deadmau5 Helmet Build Log. View more photos of the helmet here! ​Photo credits goes to my friend Jessica Fang at www.jjessfang.com!